Nivopress D hydrostatic for liquid level & pressure. 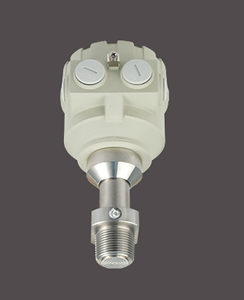 NIVOPRESS D hydrostatic level- and pressure transmitters operate in 2-wire systems and convert relative or absolute pressure (input signal) into 4-20 mA (output signal). The piezoresistive sensor measures the hydrostatic pressure and it compares the water head with the actual atmospheric pressure. The sensor is protected by a stainless steel flush diaphragm which transfers the pressure value to the piezoresistive sensor through silicon oil. Intelligent electronics provides on-site programming with SAP-200 plug-in display or remote programming with HART communication. Intrinsically safe (Ex ia approved) models are available for use in hazardous environments. NIVOPRESS D hydrostatic gauge pressure transmitters are suitable for level- and pressure measurement tasks in tanks, vessels and pipes especially in food and beverages industry (for example milk and any other food dollops) applications. The flat surface of the diaphragm avoids the risk of material build up and the maximum medium temperature of 125 °C (275 °F) allows proper (CIP) cleaning required by the regular cleaning processes of the food industry and similar hygienic applications.